​I have a confession to make. I dislike winter as a season. I always seem to get hit with the winter blues, and seem off my groove. I find I need lots more rest in winter time. I have come to realize it is because I am, in part each winter, planting deep seeds which need time to sink in before the spring rains arrive. To me, winter means waiting. And that’s also partly why I feel I need extra rest. Because I get tired of waiting, and like to make my schedule busy to distract myself. 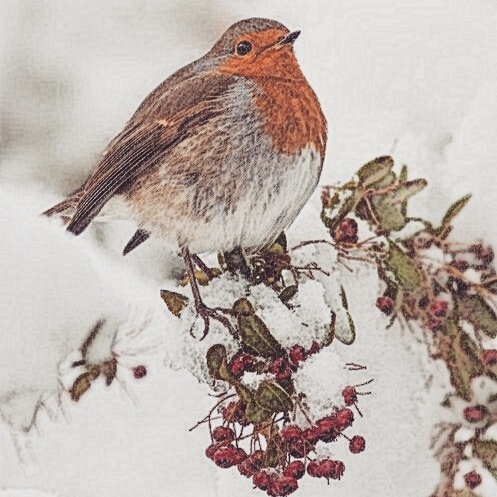 I was reminded today by this pic of a robin, that birds too have to wait out the winter season. To rest and get cozy in their nests. And that they too get a jolt of hope at the first whiff of spring. I am a daughter of the King, beloved chosen Bride of Christ, precious jewel in His crown, apple of His eye. Not the wait of my hard times, painful hurts or pending dreams. And God reminds me each and every time I need it, how He is here for me. In the winter seasons, through the wait. In the celebration of spring, the harvest of fall, the warmth of summer. He is not only my strong anchor in the hard times, He is my constant hope, and my sure foundation. So I choose to come near to Him, lay my burdens at His feet and find true rest for my soul again tonight. There is room in His house for you too, friend. Don’t let winter drive you away from the warm fire of His loving embrace.